How do you honor friends or loved ones for their sacrifice, commitment and service in the Army when you can't find the words? With two coins — our commemorative Army Service Coin and our liberated Iraqi coin. Your gift comes in our signature velvet box and includes our Products for Good story and certificate of authenticity. Show your appreciation for the soldiers in your life with our customizable Army 3-Coin Velvet Box. 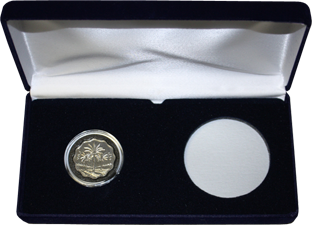 Your gift includes a liberated Iraqi coin, an Army Service Coin and a commemorative Army coin of your choosing.